NASHVILLE, TENN. –November 13, 2013 – Family Force 5 announces their 5th Annual “Family Force 5’s Christmas Pageant” tour in partnership with CURE International. The tour will feature the newly announced FF5 line-up plus special guests Flame, We As Human and V Rose. The 11-city tour will begin on December 2 and conclude December 15, dates listed below. This tour will have a special cause as Family Force 5 is hoping to help give the gift of healing to one child each night through CURE. CURE shares the good news of God’s love in 29 countries, where the organization provides surgical healing for kids with curable physical disabilities. Click here to watch a quick video about CURE. Throughout the tour, participants will have the opportunity to financially partner with CURE and Family Force 5. Their funds will go to a specific child in one of their hospitals to receive the surgery he or she needs in order to be healed. Click here to see an example of a child that Family Force 5 is helping. 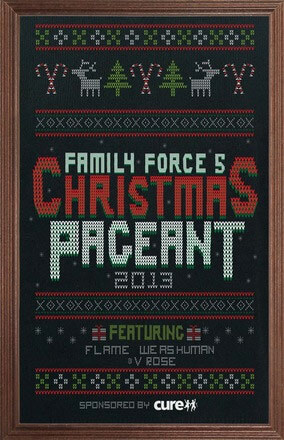 This holiday tour extravaganza started in 2009 with the release of Family Force 5’s album The Christmas Pageant. In traditional Family Force 5 fashion, “The Christmas Pageant” promises an evening of classic holiday tunes in their incendiary dance-rock style as well as possible snowstorms, over-sized presents, outrageous costumes and more fun-filled surprises with the goal of making a difference in a child’s life. About FAMILY FORCE 5: Crouton (Jacob Olds), Fatty (Joshua Olds), Nadaddy (Nathan Currin), Chap Stique (Derek Mount) and new addition Hollywood (Teddy Boldt) continue to evolve and create music that take their fans on a journey. This journey includes their energy-driving live show, which has become the most significant live experience of the 2012-13 festival season with Family Force 5's late night DJ sets and dance parties. Their music videos capture the live-show energy and have received more than 16 million YouTube views collectively between their most popular videos (“Cray Button,” “Zombie,” “Chainsaw,” and “Dance or Die”). FAMILY FORCE 5 has earned a loyal following culled from its endless touring, chart-topping albums, and strong success at radio. Singles “Superhero” and “Not Alone” enjoyed considerable time in 2013’s CHR Top 10, while the video for “Wobble” reached number 1 on mtv.com. The group’s previous album, 08’s Dance or Die, debuted at #30 on the Billboard Top 200 chart and at #8 on the Modern Rock chart with 13,000 copies sold in the first week. An Alternative Press magazine cover story followed and the group co-headlined the completely sold-out “Alternative Press Fall Tour” with 3OH!3 and The Maine. Family Force 5 is fresh off a tenacious campaign on the 2013 Rock and Worship Roadshow, and is primed and prepared for another year of party-rock mayhem. About CURE: CURE International's mission is to heal the sick and proclaim the kingdom of God. It is the largest provider of reconstructive surgery to disabled children in the developing world. Since opening the doors of its first surgical teaching hospital in Kijabe, Kenya, in 1998, CURE’s focus on bringing healing to developing nations has resulted in more than 2.1 million patient visits and over 150,000 surgeries to correct physically disabling conditions. CURE hospitals are located in Afghanistan, Dominican Republic, Ethiopia, Kenya, Malawi, Niger, Uganda, United Arab Emirates, and Zambia. The Tebow CURE Hospital is also currently under construction in the Philippines. CURE has also trained more than 6,600 medical professionals, raising the standard of care in the countries where it operates. Please visit http://cure.org for more information. For more info on Flame visit the JFH Artists Database.